Minister of State (Independent Charge) in the Ministry of Commerce and Industry, Nirmala Sitharaman, clarified on 6 May 2015 to the Rajya Sabha on India’s stand at the World Trade Organisation (WTO) on food security. 1) A decision was adopted by the WTO General Council in November 2014 which makes it clear that a mechanism will remain in place in perpetuity until a permanent solution regarding this issue has been agreed and adopted. 2) The decision also means WTO members (countries) will not challenge the public stock-holding programmes of developing country members for food security purposes, in relation to obligations under the WTO Agreement on Agriculture. 3) The safeguard available for continuing the Minimum Support Price policy is thus strengthened and will ensure that India’s food security operations are not constrained due to WTO rules. 4) The WTO General Council Decision includes a firm commitment to engage in negotiations for a permanent solution. Together with other developing countries, India has proposed an amendment to the rules of the WTO relating to public stock-holding for food security purposes. Sitharaman told the Rajya Sabha that “concerned at the lack of progress in implementing the Ministerial Decision on public stock-holding for food security purposes, India decided not to join the consensus in the WTO on next step for the implementation of the Trade Facilitation Agreement till its concerns were addressed”. Campaign material by GRAIN and Via Campesina to stop seed laws that criminalise farmers and to defend local seeds. A convergence that the agri-business multinationals have long looked for is now beginning. The UN Food and Agriculture Organisation – whose constitution includes “bettering the condition of rural populations” as one of its four main purposes – has joined forces with the World Trade Organisation, whose concern for rural populations is precisely zero. Both organisations call it a collaboration, but that term is a smokescreen. The FAO is technically being run under the supervision of its eighth director-general (since 1948; their tenures are far too long and Asian and South American members especially ought to have corrected this error long ago). José Graziano da Silva, the number eight, has since 2013 increased the pace at which the FAO also collaborates with the private sector – which means the international grain traders, the agricultural commodity cartels, the food and beverage multi-nationals, and last but not least the exceedingly powerful agricultural biotechnology corporations. The WTO has described the new alliance as a “step up” on the issue of “trade and food security, as well as other issues”. The first item of collaboration by the trade body with the FAO will be to participate in the annual State of Agricultural Commodity Markets report, which this year will focus on trade and food security, and which the WTO has mischievously described as “the FAO’s flagship publication”. It isn’t, for the FAO’s State of Food and Agriculture is the flagship report, but that misappellation is a sign of the changes to come. What is being sought, from the WTO point of view, is “evidence and greater clarity on a range of issues related to trade and food security”. This is ingenuous, for the WTO’s ‘greater clarity’ has only meant more trade, justified with make-believe macro-economical models that pretend trade is good for low income consumers and smallholder farm producers alike, and to ignore ground truth. For the FAO on the other hand, ‘greater clarity’ on the question of food and trade has long been available in-house in the form of the food balance sheets maintained for every country in FAOstat, which is the voluminous FAO database. But the tone is being set by the WTO, which has said: “Considering the important role of open and strengthened food markets in supporting food security objectives, the two directors-general discussed how trade and the multilateral trading system could help in creating a more favourable global environment for food security and sustainable agriculture.” It obviously doesn’t occur to WTO Director-General Roberto Azevêdo and his secretariat that ‘the multilateral trading system’ and ‘sustainable agriculture’ are fundamentally incompatible. 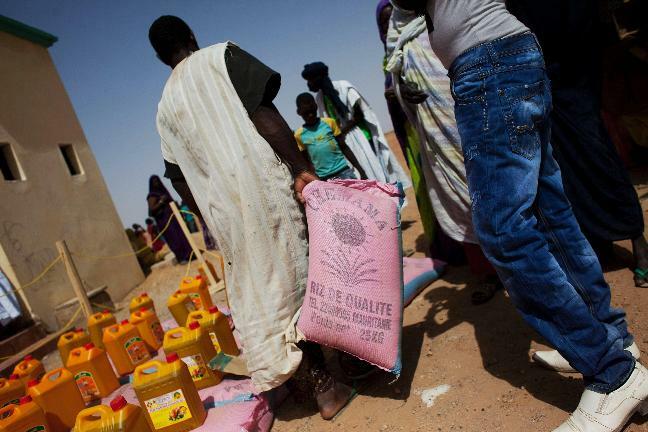 The FAO’s description of its new alliance is couched in milder terms. The organisation has said the collaboration offers “mutual assistance on critical themes such as the functioning of international grain markets” but also invokes “evidence and greater clarity” on “the governance of trade flows and the pursuit of broader food security”. FAO has resorted to using the non sequitur that food security is closely linked to trade and therefore this alliance is important. As with the WTO, internal contradictions don’t matter – if FAO is discussing smallholder family farms, then food security doesn’t include trade; if FAO is discussing organic cultivation, then food security doesn’t include trade. But under an alliance with WTO, unquestionably it does. FAO Director-general José Graziano da Silva has insisted that “food security and trade can together play a very important role to help fulfil FAO’s mandate”. What part of the mandate could be ‘helped’ by this alliance? The FAO member states are committed under its constitution to (1) raising levels of nutrition and standards of living of the peoples under their respective jurisdictions; (2) securing improvements in the efficiency of the production and distribution of all food and agricultural products; (3) bettering the condition of rural populations; and (4) contributing towards an expanding world economy and ensuring humanity’s freedom from hunger. 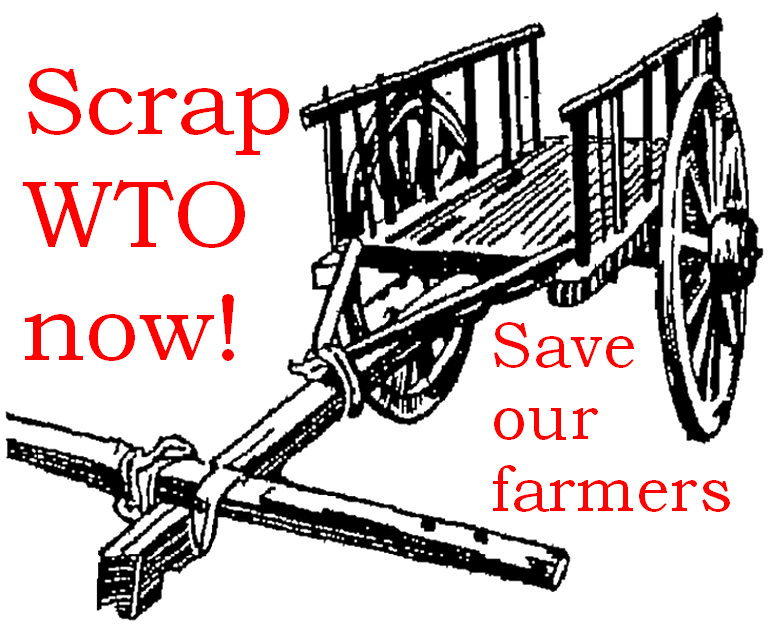 If called upon to do so by FAO member states – and I wish the G77 would summon up the critical voice to do so – the new alliance will probably be explained by the WTO and FAO as helping to fulfil the second and fourth objectives. Thus ‘improving the distribution’ of food and contributing to ‘expanding the world economy’ is what the alliance will use to show that the FAO’s mandated objectives (problematic as hey are already) are being followed. 1. The FAO overtly supporting the push, through the WTO, by the USA and other major grain exporting countries, for developing countries to increase their ‘trade facilitation’ measures – which means their physical and policy readiness to receive grain and manufactured food, no matter what the cost is locally. 2. This push will become stronger and energetic very quickly. So far, the Bali decision on public stockholding for food security purposes is to remain in place until a permanent solution is agreed and adopted. The WTO, the USA and the European Union want negotiations (which in their parlance means that all other countries accept their proposal) to be agreed to and adopted by 31 December 2015. 3. The new WTO-FAO alliance will immediately start exerting pressure on India, countries of the South and the G77 on Bali decisions concerning agriculture: tariff-rate quota administration, export competition and phasing out of cotton subsidies. 4. The FAO using trade-related arguments to defend the unacceptable biases in the existing WTO Agreement on Agriculture, and to beat down the developing countries stand (taken at the Bali ministerial meeting of the WTO in 2013) on the issue of public food reserves for food security. 5. 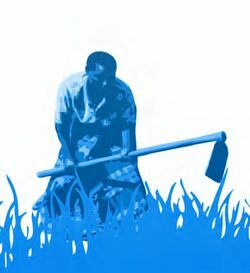 The WTO using the FAO’s long experience in the field to sharpen its attack on the public food reserves systems of developing countries – which the US Trade Representative and its allies in the OECD calls ‘trade distorting’ – so that the socio-ecological institution of the smallholder farmer, and family farms, are done away with. As we had expected in 2013 December, the mutual back-slapping over the WTO ‘deal’ between Indian and the USA evaporated very quickly indeed in the face of American business aggressiveness. For the US industry, business and trade associations and lobbies, ‘partner’ means vassal, ‘deal’ means binding obligation, ‘priority’ and ‘sanction’ become weapons (which hurt the poor and vulnerable the most), and ‘trade’ itself means subservience. And this is why this week, the last of 2014 February, the National Association of Manufacturers in the USA – which represents some 50 American business groups – asked the US Trade Representative to designate India a Priority Foreign Country in its 2014 report. “This designation appropriately would rank India among the very worst violators of intellectual property rights and establish a process leading to concrete solutions,” NAM said in a letter to US Trade Representative Michael Froman. In its official foreign policy and business pronouncements on India, the government of the USA, its representatives and its agents adopt a tone reminiscent of the 1950s, when American foreign policy and its agricultural scientists joined forces to bulldoze a green revolution in India. Here and now too, the USA likes to hear itself make statements such as “the promise of the 21st Century depends squarely on a robust US-India commercial and strategic partnership” and “central to this partnership will be the co-development and sharing of our best technologies, as well as free-movement between our economies of our best minds and thinkers”. But the US doesn’t do diplomacy. America’s manner and approach has always been, my way … or else. And that is why one of the most powerful factors influencing Indo-American business and trade connections, the US India Business Council, through its seniormost officer (Ron Somers, who had worked for the energy company Cogentrix in Karnataka), called “attention to India’s need to calibrate regulations to protect data, or inspire India’s future legislature to adjust its Patent Act to align more wholly with international norms particularly regarding incremental innovation”. The USIBC also bluntly said: “Everyone agrees that India needs to spend more on its healthcare system” and that “evolving ecosystems that reward and protect Intellectual Property will be crucial”. These disagreements between India and the USA have surfaced anew because the USTR is holding public hearings for its annual report, scheduled to be issued in April. This report will be on countries that the US government thinks are “denying protection of IP rights or fair market access to US firms”. The USTR has said that “India is widely perceived in Washington as a serial trade offender, with US firms unhappy about imports of everything from shrimp to steel pipes they say threaten jobs, as well as a lack of fair access to the Indian market for its goods”. This is among the most signal, and deliberate, failures of the two UPA terms of government – that its reckless and dangerous chasing of foreign direct investment and its reckless and dangerous opening of domains previously in the public sector to private interests have left Bharat and India in such a crippled state that we as a country tolerate such an insult. There is not the slightest hint of fairness in America’s bullying ways, for it wants nothing less than the capitulation of India’s pharmaceuticals industry, and it wants the handing over of insurance – from life insurance to automotive to weather – to its own freebooting companies whose practices have assisted the plunge of a sixth of America’s population into poverty over the last decade. What may happen now? There are press reports that India may take the USA to face the WTO’s dispute settlement mechanism if included by the USTR in the ‘Priority Foreign Country’ list for intellectual property rights. American industry and trade lobbies are putting pressure on their government to include India under this list. Thus far, the position held within the central government is that the demand (from the US companies) is “completely wrong” as India’s intellectual property rights are compliant with global laws, including that of the World Trade Organisation (WTO). It is concerning pharma that the American MNCs are most vociferous. US pharma companies had objected to India’s move to issue a compulsory license in 2012 to Hyderabad-based Natco Pharma to manufacture and sell cancer-treatment drug ‘Nexavar’ at a price over 30 times lower than charged by patent-holder Bayer Corporation. A delegation from the US International Trade Commission (USITC), described as a quasi-judicial agency, has arrived intending to probe the impact India’s policies on trade and investment have on the American economy (the intention is to supply the USTR with ammunition and to prepare for a WTO dispute confrontation; the Americans involved perhaps cannot see or appreciate the irony of the USIBC also praising India for investing in the USA and creating jobs there). The USITC has raised the Natco matter, and has also raised the rejection of patent to Bristol-Myers Squibb’s Sprycel and Novartis’ Gleevec. It has stated that Indian IPR laws are not Trade Related Aspects of Intellectual Property Rights (TRIPS) compliant under the WTO. The response of the government of India has been to ask all its officials to stay away from any interaction with the USITC delegation. But we have stood firm till here. Swiss pharmaceuticals manufacturer Novartis AG had lost a legal battle for getting its blood cancer drug Gleevec patented in India and to restrain Indian companies from manufacturing generic drugs. The Supreme Court had rejected the multinational company’s plea last year in a judgement that was loudly and widely hailed in all countries of the South. This came as a blow to the US-EU pharma MNCs who see the very much larger populations of the South as new markets. Hence the threatening fist-waving by the US government. The complaint by American companies that India refuses to implement laws to provide data protection and to provide patents for bio-pharmaceutical companies is framed in terms of being against the interest of Americans in terms of jobs and ‘fair’ competition in the global marketplace. To support such nonsense, the US Chamber of Commerce’s Global IP Centers issues what it calls an International Intellectual Property Index, which compares the IP laws and implementation of those laws of 25 countries. In the 2014 Index, India received the lowest overall score, with a score of 0 for ‘Membership and Ratification of International Treaties’ and 0.25 for ‘Trade Secrets and Market Access’. India’s policy on generic drugs has so far refused to accept ‘evergreening’, a scheme used by pharmaceutical companies to continue having a patent over a drug – even after its patent has expired – by modifying it slightly. India’s decision to grant compulsory licenses (within Indian and WTO rules) to anti-cancer drugs by Novartis and Bayer has infuriated Big Pharma in the US. To retaliate, the USA banned Ranbaxy selling medicines from its fourth plant in the USA – so much for being ‘fair’ at home in America; why does Ranbaxy continue to want to do business there? India’s generic drug policy is guided by the need to provide cheap medicines to a large population that cannot afford even a fraction of the international patent-protected prices of these medicines, as several authoritative civil society responses to the matter have competently pointed out. This is the practice the judiciary has supported and this is the practice that must not change under any circumstance and regardless of the threats and blandishments by Froman and his shylockian collaborators. This year the Food and Agriculture Organisation (FAO) will through its Committee on World Food Security, advocate principles concerning what are called ‘responsible agricultural investments’. The adoption of principles such as these are expected to promote investments in agriculture that contribute to food security and nutrition, and which support the realisation of the right to food, particularly within national contexts of how food security is defined. While the principles are intended to provide practical guidance to governments, private and public investors, intergovernmental and regional organisations, civil society groups, research units and universities, donors and philanthropic foundations, they will be voluntary and will not be binding upon their signatories. The problem with such a conceptualisation of international or globally applicable principles is that the negative consequences that accompany investment are left undefined and therefore weak as a countervailing argument. Investment made to acquire land, to pursue industrial agricultural techniques (in contrast to policies and programmes that support smallholder cultivation), and which – experiences of the last three decades have shown – have deepened income inequalities while making those vulnerable to food scarcity and food price volatility even more so. These investments are determined by a dominant political economy found in a country, or a sub-national region – important variations that cannot be recognised or dealt with in any meaningful way by a set of voluntary principles (nor even with the aid of a ‘knowledge platform’ on the subject set up by the World Bank, FAO, UNCTAD and IFAD. 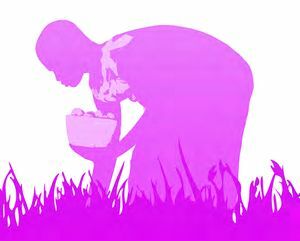 In this article published by Pambazuka News – the pan-African community of some 2,600 citizens and organisations that make it one of the largest and most innovative and influential web forums for social justice in Africa – I have examined the rationale and background to the principles pertaining to ‘responsible agricultural investment’ (which is now referred to commonly by the ‘RAI’ short form); and also concepts about agricultural investment (or public and private spending on agricultural activities) especially what are assumed and what are implied; and a conclusion criticises the RAI and the effort to promote a multi-lateral common ground for problems that are essentially local. Moreover, from the point of view of human rights terms this is discriminatory; and will turn a parlous situation into a destabilising one – already countries are falling short of their obligations related to realising the right to adequate food (a foretaste of which was seen most recently during the World Trade Organisation ninth ministerial conference in 2013 December which brought to the fore disagreements about governments’ own procurement of food for public programmes as distorting world trade). Update: So far, India’s Minister for Commerce and Industry has said what our farmers’ need him to say at the WTO ministerial meeting. This is good news for our millions of cultivator households, and is also good news for cultivating families and communities in the countries of the South. This bloc must oppose without reservation and compromise of any kind the USA- and EU-led puppeteering of the WTO rules of agriculture to help their food-seed corporations. The reaction in the corporatised media has been typical, with headlines like ‘Bleak outlook for WTO deal as rifts widen over food subsidies’. 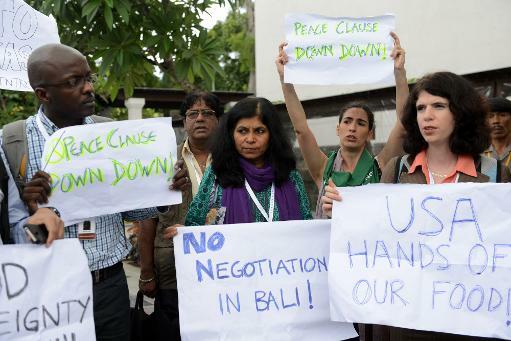 Reuters has reported that there are “deep divisions with only one day left to the end of talks” but that “India gains supporters for its stance on food subsidies” and also that “a Bali deal could benefit world economy by as much as $1 trillion”. We have no idea where these absurd numbers have appeared from concerning the alleged ‘benefits’ of the WTO, but foreign and Indian media have also reported the spiky warnings from the Trade Representative of the United States of America, Michael Froman. He is reported to have said: “Let us not sugar-coat reality: leaving Bali this week without an agreement would deal a debilitating blow to the WTO as a forum for multilateral negotiations.” Froman and his government don’t (or won’t) understand that such an outcome is exactly what we want – no more WTO, for good and forever. He is also reported to have that if the WTO is finished “the unfortunate truth is that the loss will be felt most heavily by those members who can least afford it”. Froman is lying, for it is with WTO that farmers and cultivators in their millions have suffered grievously for a generation. The Hindu reported that developing nations including India want a ‘peace clause’ (see a few paragraphs below for why we should have no such ‘peace clause’) “till a permanent solution is found on the matter for smooth implementation of the food security programme”. The Hindu report has quoted Sharma as having said that India was not isolated on the food security matter in WTO and majority of countries where over 75% people live are supporting New Delhi’s stand. “I would like to make this absolutely clear that we have not come here as petitioners to beg for a peace clause,” he was quoted as having said. The section of foreign media that has long spoken for the USA-EU axis of agreement on WTO and its perverse agriculture rules has complained about what it calls India’s opposition. One such newspaper is the Wall Street Journal, which has reported that India “is angry over WTO rules that don’t allow it to move ahead with a massive food subsidy programme”, that negotiators have been trying to win over India by “allowing it to break those rules for four years before reducing the scope of its subsidies”. It needs to be said here (see more below) that an outside agency’s ‘rules’ are immaterial to what Bharat’s people need, and that there is no question of any agency, country, group of countries or foreign entity of any sort ‘allowing’ India to decide the manner of its service to its people. Earlier: Our kisans and our farmers have no use for a WTO ‘peace clause’. Our households and families that squeeze their weekly budgets to buy their food staples have no place in their lives for definitions of ‘market distorting subsidies’. Our retailers and wholesalers and fair price shops which supply these households and pay our kisans for the food they grow are much too busy to bother with what ‘amber box’ and ‘green box’ mean, or with the Ninth Ministerial Conference of the WTO. The question is one not of food sovereignty or the right to food alone, it is also one of our country’s sovereignty and of democratic principles to be respected. For the so-called ‘developed’ countries who are also WTO members, the government of India paying farmers a minimum support price to buy crops that can be stocked (as needed) or released into the Public Distribution System is a ‘market distortion’ and they have invoked all sorts of WTO regulations to show why it is. This is dangerous and must be firmly and finally treated as a threat to the integrity of the Republic of India and its citizens. Whether those who have been sent to the WTO Ministerial Conference (in Indonesia, 2013 December 03-06) to argue India’s case will do so in a manner that protects our kisans and our households is yet to be seen. Food security, prices that balance the income of farmers and the needs of food-purchasing households, and the quantities involved are matters that lie between the people of Bharat and the government (central and state) that exists to serve us. It is not the business in any way, in any year and under any pretext, of any of the other 192 member countries of the United Nations or of any grouping from amongst them. It is not the business of any UN agency nor any multilateral and/or inter-governmental body or agency regardless of whether India is a member or signatory to any such group or entity. That is the meaning of the sovereignty that exists as the contract between citizens and the state, and that means between us and the government of the Republic of India. An agricultural road ahead minus a WTO is what India must strive for now. Are India’s named representatives at the Ninth Ministerial of the WTO saying so clearly and loudly so that the entire UN system and the WTO can hear? Here is an extract from the statement made by the Union Minister of Commerce and Industry, Anand Sharma, on 2013 December 02: “We cannot continue to have rhetoric of development agenda without even a reasonable attempt to address the issues which are of primary concern to developing economies. For decades, handful of farm lobbies of some countries have shaped the discourse and determined the destiny of millions of subsistence farmers of the developing countries. The massive subsidisation of the farm sector in the developed countries is not even a subject matter of discussion, leave aside serious negotiations.” This position may be useful, but we have to wait and see how it is developed between now and the end of this Ninth Ministerial. That it may not be developed is already hinted at, for the same minister has also said: “It is therefore difficult for us to accept an interim solution as it has been currently designed. As a responsible nation, we are committed to a constructive engagement for finding a lasting solution. 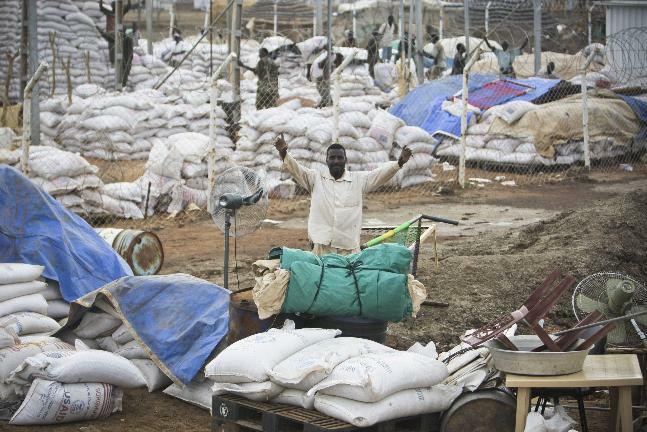 But till such time that we reach there, an interim solution which protects us from all forms of challenge must remain intact.” The ‘interim solution’ is what has popularly been called a ‘peace clause’, by which is mean that the use of measures to procure foodgrains by developing countries to promote food security would continue to be deemed illegal but WTO members would not go into the process of dispute settlement for a certain period. Moreover, this ‘interim solution’ will be effective for only four years (that is, less than a single of our Plan periods) and Sharma’s saying that “we are committed to a constructive engagement for finding a lasting solution” is no indicator that our representatives to the WTO will tell the WTO that our farmers, our crops and food and our prices is none of its business. As the Institute for Agriculture and Trade Policy has mentioned, a country might seek to use both purchases and sales of stocks to support a level of equilibrium in market prices that supports long-term development objectives. The bloc of so-called ‘developed’ countries – the USA and some of its habitual crony countries, and the European Union, all of them having subsidised their agriculture heavily and steadily for 50 years – are holding up WTO ‘rules’ to say that if the price paid by our government is higher than the ‘external reference price’, the difference is considered a ‘trade-distorting subsidy’. And what is this reference price? The average international price of 1986-88! As anyone who has even a passing interest in food knows, true food inflation (which households experience) in most of the world has for the last six years been 10% and above. Fuel price inflation has been as much if not more. Fertiliser price inflation: ditto. It is the USA and (some) countries of the EU that have annually supported the cost of cultivation and held retail food prices low to the extent of half their agricultural GDP – which they today say is permitted under WTO rules, but that India’s crop procurement prices is a ‘market distorting subsidy’ that gets in the way of a ‘free market price’! Several farmers’ organisations, trade unions and peoples’ campaigns in India have resolved to support the Indian government’s position to not trade away national food security. The group welcomed the decision of the Indian Cabinet on 2013 November 28 November to reject any “peace clause” that does not guarantee a permanent solution. The peace clause has been widely opposed by the Chairs of the Parliamentary Standing Committee on Commerce and Agriculture, the Left parties, and mass organisations, which include Bhartiya Kisan Union, Bharatiya Krishak Samaj, Bharatiya Majdoor Sangh, Focus on the Global South India, Right to Food Campaign, Shram Seva Nyas, South Indian Coordination Committee of Farmers’ Movements, Swadeshi Jagran Manch and Third World Network India. 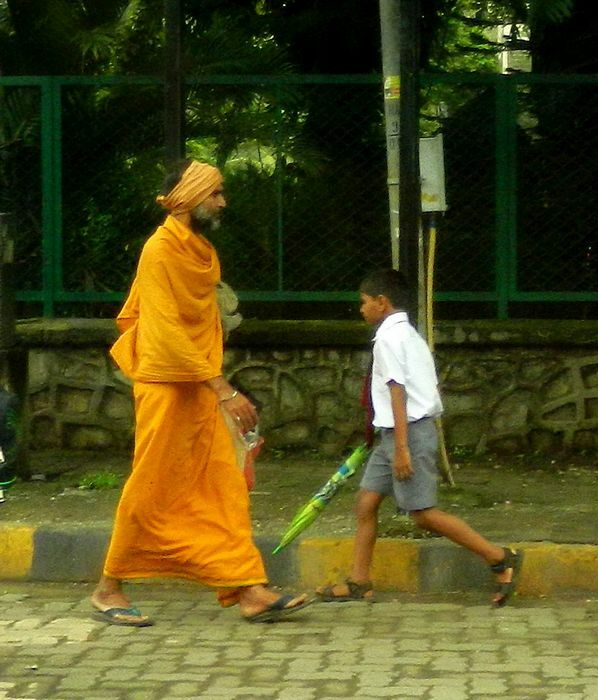 Nonetheless, the danger we in Bharat have to guard against is both outside and inside. This year, India is an active and vocal member of the group of 33 countries (G-33) whose position is that the present WTO rules which constrain the ability of developing countries’ governments to purchase food from small farmers and stock them must be clarified or changed. But India is also a BRIC country whose ministers are doing all they can to allow foreign ownership of everything from banking to airports to defence to food. Hence this stance is hypocritical (as is India’s stance at the useless and totally compromised climate change COP meetings). Thus, the danger outside is how the USA (plus crony countries) and the EU employ Indian ministers to push through the WTO rules. The danger inside is that Parliament and state legislatures – which technically represent directly affected parties – are being by-passed while the interests of the corporate-financial elite (global, regional, national) are being protected. And that is why it is time for us to give our government the ultimatum – the world is not about trade but about people and the planet. Ours is not an agriculture in the service of the WTO’s murderous rules and our kisans will not abide being beggared. The crops grown to feed our households rural and urban and the prices set in the mandis and found in the kirana shops are a matter for Bharat. That is why it is time for us to face down the sly brokers in the WTO – and their masters – once and for all. It must be difficult to be a senior official in the Food and Agriculture Organisation (FAO) of the UN these days, especially if the official is above 40 years old and has spent the last two decades working “in the field” (which usually means away from some capital city somewhere, in discomfort that is amusingly relative to most of us proletarian toilers). For, I do think that there is still a majority of folk in the FAO who care about their work and the aims of the organisation, muddled though these get when 190-odd member states each bring their own version of reality (and ambition) into the proceedings. More difficult it is nowadays in an FAO that is being shepherded more closely into the embrace of the OECD, the World Bank-International Monetary Fund, World Trade Organisation embrace, with its murmuring old boys’ clubs all shadowy in their suits, adept at facilitating the trade of political positions for corporate board seats. And more difficult it is nowadays in an FAO that is scrutinised every day by NGOs and civil society groups that have successfully ensured that negotiations called ‘multi-lateral’ must be open before public gaze and can no longer hide behind empty principles when hunger – FAO’s single problem – stalks the planet. Perhaps that is one reason why the FAO has called this year’s World Food Day ‘Sustainable Food Systems for Food Security and Nutrition’ – and notice the addition of ‘nutirion’, there’s no getting away from the N-word these days, so loaded has it become. The theme, to borrow from the typically bland FAO pronouncement, “gives focus to World Food Day observances and helps increase understanding of problems and solutions in the drive to end hunger”. Well said, for the umpteenth time. But there have been departures from the corporate script lately which are surprising. On 2013 October 04 the Director General of FAO, José Graziano da Silva, formalised a tie with La Via Campesina, recognising it as the most important voice of small food producers worldwide. 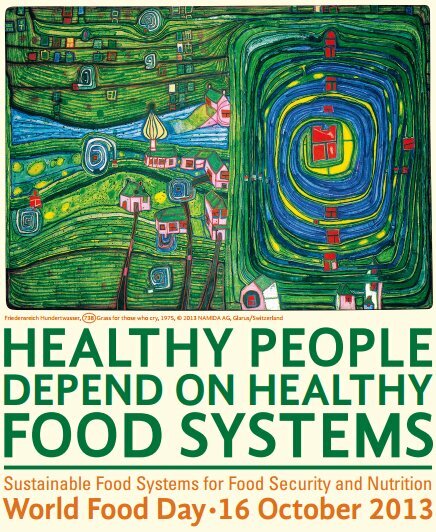 This is seen by Campesina as “yet another welcome step in a series of ongoing reforms of the FAO, which have created a unique and unprecedented space to collaborate with civil society and democratize the arena of global food policy”. 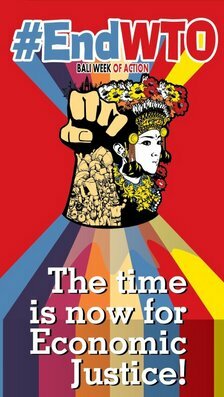 Easier wished for than done, as Campesina well knows, because the financiers and bankers, agri-commodity trading oligopolies and mafioso, the crooked politicians in the European Union and their willing partners in the ‘developing’ world are not going to quietly let this happen. These reforms are aimed at giving the FAO not just more political legitimacy by becoming more inclusive, but also at reviving it as the cornerstone for international cooperation in the area of food security, starting to take such policy decisions out of the hands of the World Bank (WB) or the World Trade Organization (WTO.) 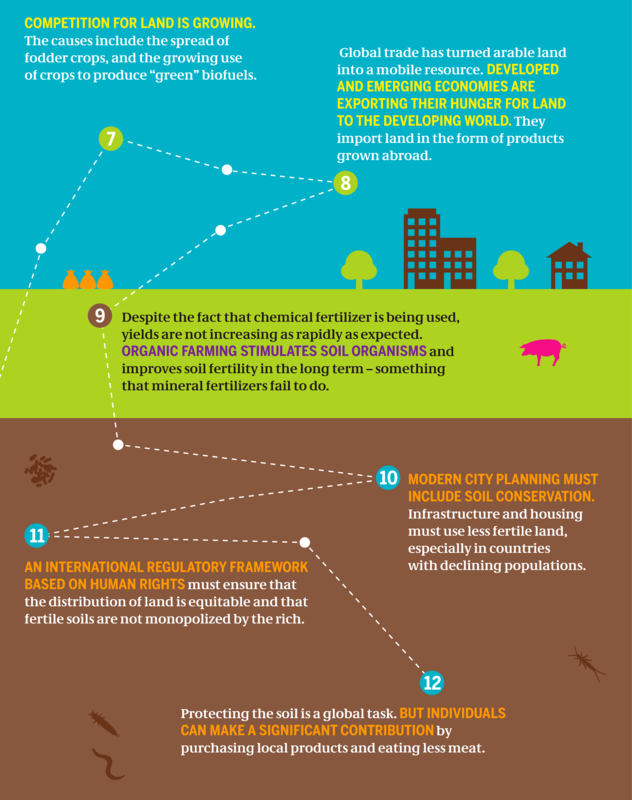 While these developments are welcome, the global peasants’ movement remains realistic about the amount of energy that should be put into the UN, maintaining its greatest strength on the ground mobilizing farmers and building alternatives. The IFPRI Global Hunger Index 2013 world map, blatantly patronising in its North-South exclusion. The white areas are not even in the map legend. They correspond to the OECD/’industrialised’ world, and the IFPRI/CGIAR view is that the chronic mis-nutrition of western societies has no place in a report on global hunger. Nor does this map consider the growing effects of working class poverty in the OECD countries. In 2012, at the 39th session of FAO’s Committee on Food Security (CFS), the G20 approached the CFS and asked the Committee to agree with what it said on price volatility in agricultural commodities, which since 2007 has dragged tens of millions of households in South and North into hunger and debt. When that happened, and when a compromised CFS agreed, the civil society delegation to the session walked out. The NGOs, social movements, representatives of peasants’ federations and associations who were present had, on the contrary, demanded strong regulation of the commodity futures markets that fuel price volatility and the food insecurity of the poorest. But the G20 (and that means the investors in a global agribusiness industry) won that round. With the help of the CGIAR, what for the sake of convenience we call the G20 will want to win every time. The CGIAR is the Consultative Group on International Agricultural Research which runs 15 centres around the world that are described as “independent, non-profit research organizations, innovating on behalf of poor people in developing countries” and as being “home to almost 10,000 scientists, researchers, technicians, and staff working to create a better future for the world’s poor”. The descriptions about ‘independent’, ‘non-profit’ and ‘for the poor’ are lies, as they have been for every single one of the 40 years of this plague called the CGIAR. But the CGIAR system is large, powerful, almost invisible and little understood except by those in agricultural research systems (such as those in the Indian Council of Agricultural Research) in ‘developing’ countries. And that is why the release, a few days ago, of the ‘Global Hunger Index’ 2013 needs to be interpreted for what it is, because it is the product of one of the CGIAR centres, the International Food Policy Research Institute (IFPRI). The annual index offers a ranking of hunger, or food insecurity/security for many countries but not all (see the image of the map and its caption). The IFPRI functions worldwide as a motivated think-tank that commissions carefully scripted research to fulfil pre-determined outputs that serve the interests of those who profit from the industrial agricultural system and retail food system. That such an obvious fifth column finds residence and a willing ear in India ought to be a matter of shame to us. Here is a small example why. The IFPRI, in the 2013 Global Hunger Index, has distributed its ‘recommendations’ which are from the typical neo-liberal charter of subjugation of the working classes and the denial of choice, all camouflagued by whichever development jargon is found to be currently in vogue. 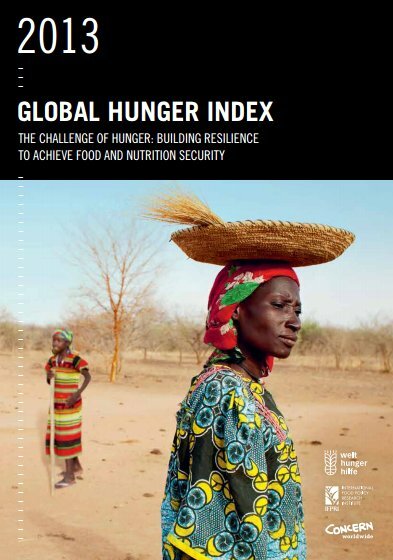 The cover of the Global Hunger Index 2013 report. Read the recommendations to grasp why this has been released, ignore the data. Hence “broader policy coherence for development is also a key requirement for efforts to strengthen resilience. Policies that undermine resilience must be revised. To foster resilience to undernutrition, policies should be designed with the intention of improving nutrition outcomes and realising the right to adequate food” in fact means – do away with policies that still see a role for the state and the public sector, hide this behind trendy concepts like ‘resilience’ and ‘right to food’, but include nutrition (which I mentioned earlier) because that is the route the MNCs have successfully used. Hence “encourage and facilitate a multisectoral approach to resilience (as the Scaling Up Nutrition movement encourages a multisectoral approach to nutrition, for example), coordinating plans and programs across line ministries” in fact means – phase out your thinking and replace it with ours, which comes with a United Nations endorsement and which places private business at the centre of policy and its implementation. Hence “adjust policies and strategies that undermine the resilience of poor and vulnerable groups, such as the low import tariffs or the structural neglect of smallholder agriculture in Haiti” in fact means – remove barriers to food imports, stop subsidies and subventions that the poor, marginalised and vulnerable have a right to in your country (consider the ruckus the World Trade Organisation has been making about India’s new National Food Security Act) and spout righteous claptrap about ‘neglect’. Hence “ensure that policies and programs draw on a wide range of expertise such as collaborative, multiagency, and multisectoral problem analysis. National governments should support the emergence of multistakeholder platforms and make active use of such forums” in fact means – the expertise will be foreign and provided by the CGIAR and its numerous allies in all garbs, these ‘multi’ platforms will be public showcases to conceal an agenda already set. There is no comparison between the IFPRI propaganda and the annual report of the Right to Food and Nutrition Watch 2013, the sixth edition of which was released in 2014 October. The Watch identifies a number of policies that generate hunger and malnutrition instead of reducing them. The Watch insists on the need for meaningful participation – at every level – of people and communities in the development of those public policies which affect their lives. You will find here national case studies and analysis that show (1) policies that foster violence and discrimination against women with regard to equal access to natural resources, inheritances, equal wages and political decision-making, (2) policies that systematically limit and exclude large groups, including peasants, agricultural workers, fisherfolks, pastoralists and indigenous peoples from participating in those decisions that affect their very livelihoods and (3) policies on a global level that facilitate land grabbing, concentrated ownership of natural resources and the commodification of public goods that deprive smallholders and other people of their food resources. From within India (Bharat, we call it) there are ever more worrying signs that the club of rich and inter-connected global corporations, financial entities and their political patrons are working in concert to fulfil their programme of rapid and sweeping change in the country. Inside India, the government of the day, a technical coalition led by the Congress Party (the Indian National Congress it its full name) has for the past two years ignored widespread public movements against corruption, against the rise in food prices, against the blatant manner in which the country’s political and industrial elite has thrived in conditions that have led to the continuing impoverishment of the rural and urban poor. In a joint call to G20 country governments, the WTO and the OECD said: “The difficulties generated by the global economic crisis, with its many facets, are fuelling the political and economic pressures put on governments to raise trade barriers. This is not the time to succumb to these pressures.” What will that call, if acted upon, do to the lives of these two Indians, one very young, the other unconcerned by the machinations of the capitalists but nonetheless affected by them? This group includes politicians and their families and cronies (regardless, mostly, of party and political affiliation (the parties of the Left excepted)), what is commonly referred to as ‘India Inc.’ by which is meant the country’s large and medium businesses, led by all those who have found inclusion in the list of the top 100 most wealthy Indians (see the latest odious ranking by Forbes magazine’s India edition), and it also includes the senior corporate and industrial associations in India and abroad (several based in the USA, which bring together the most exploitative elements of the American capitalist class who find common cause with their Indian counterparts, and who can count on the strengthening of Indo-American ties whether economic, financial, defence, agricultural or scientific to pursue their agenda) which are regularly and well represented in the World Economic Forum for example. Also ranged against the Indian (the Bharatiya) proletariat are the OECD, the IMF, the World Bank, the ADB, the several dozen thinktanks funded through government back channels and innocuous-sounding foundations apparently dedicated to ‘low carbon’ growth or ‘sustainable development’ or even water and sanitation – their cover stories all sound alike. And it is this group that sets the agenda for India between now and say 2020. The signs of how the concert is directed become plainer to see with each passing month. Let us look at a few of the many signals that have come to public attention recently. The most recent is the ‘Second Quarter Review of Monetary Policy 2012-13’, by the Reserve Bank of India (the country’s central bank), which was released at the end of October 2012. This report bemoaned the “global slowdown and uncertainty” amidst which “the Indian economy remains sluggish, held down by stalled investment, weakening consumption and declining exports”. In this report however the governor of the RBI said that “recent policy initiatives undertaken by the Government have begun to dispel pervasive negative sentiments… As the measures already announced are implemented and further reforms are initiated, they should help improve the investment climate further”. The Reserve Bank of India’s projections about the turns India’s wholesale price index can take. Yes, and what about the real price of ‘dal’ and ‘roti’? 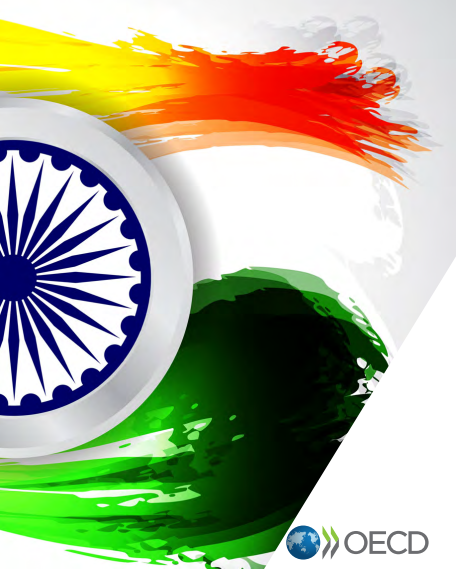 Now consider a report released by the OECD (the Organisation for Economic Co-operation and Development) entitled ‘India – Sustaining High And Inclusive Growth’ (pdf). This is part of the OCED’s ‘Better Policies’ Series, a sinister name for strong-arm pressure which the OECD describes as promoting “the OECD’s policy advice to the specific and timely priorities of member and partner countries, focusing on how governments can make reform happen“. This is what the OECD report has said about India: “The potential for sustained strong growth is high. The Indian population is young by international comparison and this together with declining fertility has led to a falling youth dependency rate. The national savings rate is also high and, given favourable demographics, could well rise further in the medium term, providing the capital needed to fund investment in infrastructure as well as strong expansion in private enterprise. Furthermore, despite employment rising in the industrial and service sectors, around half of all workers remain in low value-added agriculture. The scope is therefore enormous for economy-wide productivity gains from the further migration of workers into modern sectors.” Indeed, who will then produce the food India needs for her modest and still mostly vegetarian diet? 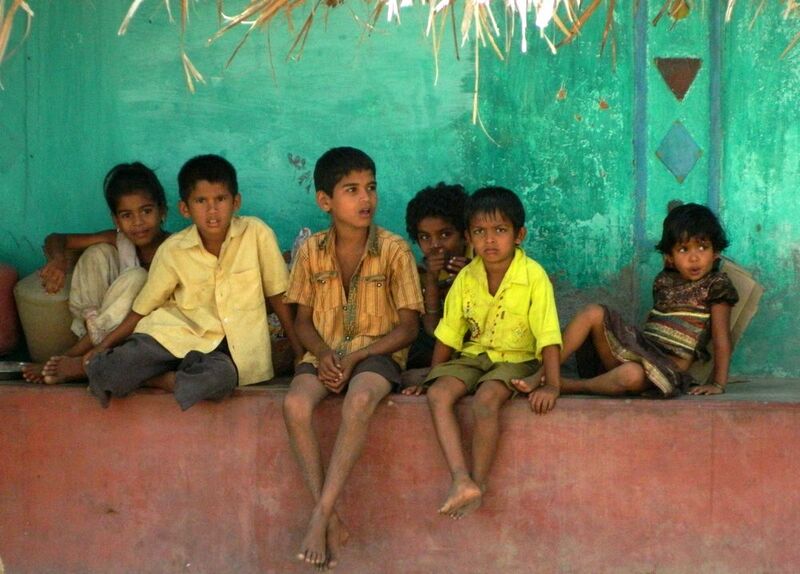 The image used by the OECD for its India report. Throw out the public sector and turn over health, transport, energy and education to the corporations, the OECD has told its India collaborators. What stands out here is the sort of language used, so common now in these inter-governmental circles of avarice and resource-grab, so worryingly mirrored in the pronouncements by India’s ruling coalition politicians and its central planners and their hired guns in compromised ‘research’ thinktanks and ‘policy advice’ units. Thus they have talked about fully reaping the “benefits of the demographic dividend” and of supporting “a return to high and more inclusive growth” (India’s Eleventh and Twelfth Five Year Plan documents reek of this statement). Thus they have repeated as a chant that “India needs to renew its commitment to sound macroeconomic policy and implementation of reforms”. The imperative given is clear and will be enforced by all arms of the executive and those opposing are threatened by punitive action, for they insist that “public finances on a sound footing and improving the fiscal framework so that persistent large deficits do not undermine macroeconomic stability and investor confidence“. 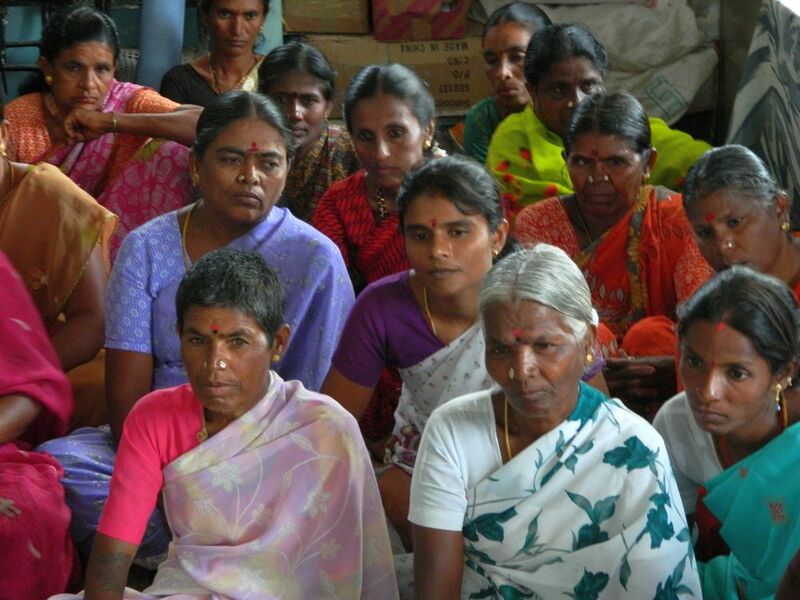 Members of a self-help group in the district of Krishnagiri, Tamil Nadu, at their weekly meeting. Where is the common Indian, the resident of Bharat, in all this? 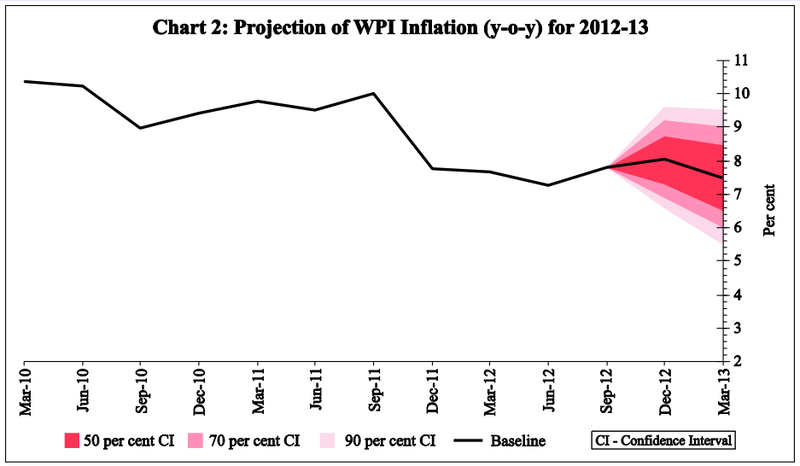 The government of India and the Reserve Bank of India say they are worried that what they call “headline WPI (wholesale price index) inflation” remained at above 7.5% (calculated only over a year) through the first half of 2012-13 (that means April to September 2012). The truth is far more severe. Retail prices per kilogram of cereals and pulses have in every single city and town in India have increased, from early 2006, by between 180% and 220%. This when the daily wages for those who spend 55% to 65% of their income on food have increased over the same period by no more than 50%. And instead, the prime minister and his advisers say foreign direct investment will provide more jobs and better wages. Did 25 years of structural adjustment as rammed down the throats of millions of citizens in the countries of the South, by the International Monetary Fund and the World Bank in collusion with an earlier generation of elite accumulators, sound any different? 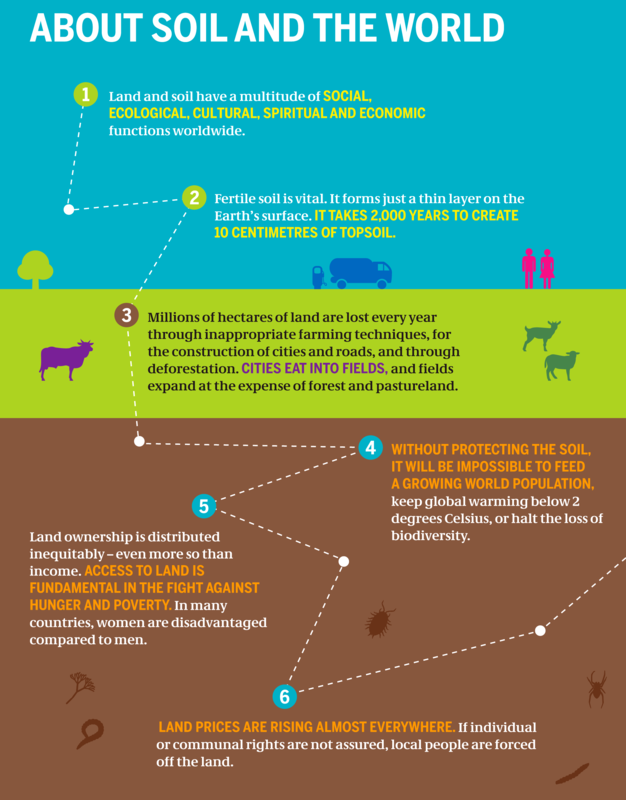 Ever since October 2011 when the world’s seventh billion person was born, there has been a new flurry of articles and prognoses about the need to increase ‘global’ food production to feed a ‘global’ population. While this may be all very well for earth systems scientists and researchers who are accustomed to dealing with planetary scale, those in charge of planning for agriculture at national and sub-national levels find it difficult enough relating to their own numbers (in India, the population of the smallest states are between 1 and 2 million, while that of the largest, Uttar Pradesh, is close to 200 million (!) which if it were a country would be placed between the fourth and fifth most populous countries – Indonesia and Brazil). 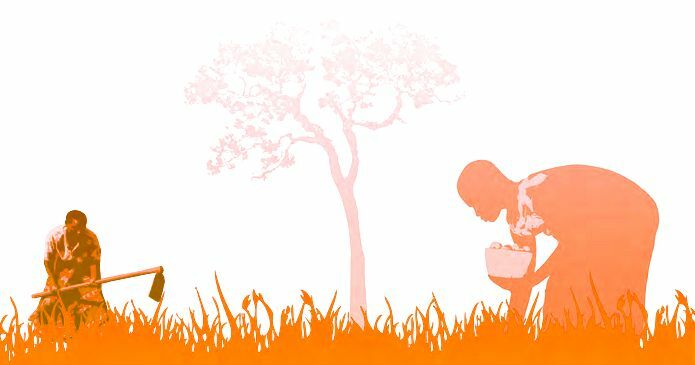 Through this year, numerous inter-governmental agencies and large organisations – including the FAO, WFP and IFAD – have discussed the need to be able to feed a population of nine billion, which we are expected to be in 2050 or thereabouts. And so says, recently, the ‘Sustainable Agricultural Productivity Growth And Bridging The Gap For Small-Family Farms’, which is the ‘Interagency Report to the Mexican G20 Presidency’ (12 June 2012). Explaining that “the growing global demand for food, feed and biofuel is well established”, this inter-agency report has said that income growth will increase the quantity and change the composition of agricultural commodity demand. I find this approach a troublesome one because on the one hand there is growing recognition (even if corrective action is small and mostly symbolic) that consumption is to sustainable the way energy efficiency is to total energy use. Why are large agency and inter-agency reports continuing to skirt a matter which should be dealt with head-on – that consumption of food by the populations of ‘developing’ countries, on the lines of that practiced by the populations of OECD countries – cannot be encouraged by the food MNCs and the global food retail consortia? It is because of this consistent refusal to see – and name – the elephant in the room that this report, to the Mexican G20 Presidency, has said: “Significant increases in production of all major crops, livestock and fisheries will thus be required”. What are the estimates provided? “Estimates indicate that by 2050, agricultural production would need to grow globally by 70% over the same period, and more specifically by almost 100% in developing countries, to feed the growing population alone… ” I am puzzled by the easy acceptance of this simple equation by the following agencies and institutions, all of whom have contributed to this report: Bioversity, CGIAR Consortium, FAO, IFAD, IFPRI, IICA, OECD, UNCTAD, Coordination team of UN High Level Task Force on the Food Security Crisis, WFP, World Bank, and WTO. There is a mathematics here that is eluding me. The estimate is that from now until 2050, world population will grow around 30% – from the current 7 billion to an estimated 9.1 billion. However, if population grows at 30%, why must the available food (excluding biofuels demand) grow at 70% over the same period? It is extremely difficult for most people (earth system scientists excluded) to make sense of such large numbers. In order to break up large numbers into more familiar terms, I have (from UN’s World Population Prospects 2010) extracted the following data. These are the populations of France, DR Congo, Thailand, Turkey and Iran, these are the world’s 21st to 17th most populous countries (in that order). In 2012 their populations are: France 63.5 million, DR Congo 69.6 m, Thailand 69.9 m, Turkey 74.5 m, and Iran 75.6 m. Let’s not try to strain to look ahead as far as 2050 (by which time some of us will have returned to our ecosystems as dust or as ashes) but look to 2027, or 15 years ahead. Then, the populations will look like this: France 67.7 million, DR Congo 99.6 m, Thailand 73.1 m, Turkey 85.1 m and Iran 83.7 m.
Thus we see that, as the ‘Interagency Report to the Mexican G20 Presidency’ has explained, it is indeed some ‘developing’ countries which will need to provide for considerably more food being grown and made available – DR Congo will have, in this short span of years, 30 million more people! Turkey will have more than 10 million more! The growth – again for the 2012 to 2027 period alone – is France 7%, DR Congo 43%, Thailand 5%, Turkey 14% and Iran 11%. Does it then still make sense to speak of 2050 horizons and 2.1 billion more people when we are at best talking to national planners, sectoral administrators and thematically-oriented agencies accustomed more to district boundaries than continental spreads? I say it doesn’t – and the less time and money and conferencing we expend on these beyond-humanscale numbers the more sense we will make to those in need of guidance. The question then resolves itself as being more prickly, and more in need of hard answers – if the 30 million additional people in DR Congo are to choose a diet that has 50% less meat and 50% more indigenous vegetables and tubers and roots in it, will DR Congo still – over this period alone – need to plan for growing 43% more food (grain) to keep pace with population growth? 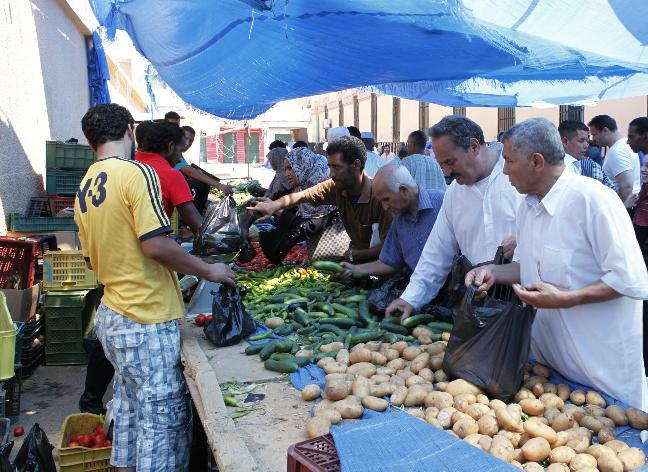 Will Turkey need to do the same (time to encourage more çorbasi and less schwarma perhaps! )?